We released an update for 9.1 today (build .11457), including an important fix for Docked windows and some tweaks in the IDE. You can view the changes here. We plan to release an alpha build of Clarion 10 next week. I’ll be writing separate posts on what’s new in C10 in the coming days. An update to 9.1 is being released today, it has some useful fixes, many of which have already been field tested by the developers who reported them. They (Gartner) predict that Windows will grab 39 percent of the tablet market in 2016. You can be sure that you’ll have many users wanting to run your Clarion apps on their (Win8 Pro – x86 based) tablet. So roughly speaking they are predicting there will be about 5 million users on Windows tablets. Even if they are off by a million or so, its inevitable that touch and tablets are in your future, and its a good bet that some of those tablet users will be your end users. The example shows how to use the interfaces contained in the touch. * source files (located in your .\libsrc folder). It provides a nice look at some of the new features your apps can now support for an optimal “touch” experience (above and beyond the support the RTL provides automatically). This fixes OLE server automation, such as automating MS Office components, and came about as a result of the support added for registration-free COM. Surprisingly even after months of beta testing this wasn’t found until after the 9.1 gold release. FIX: Possible IDE lockup when there is very large number (hundreds) of local/global variables/tables in the Procedure and the IDE is processing the closing of an embed. FIX: Possible failure on closing APP if embed tree with orphan embeds has been touched. There are many other fixes and changes, you can see the full list here. After a long and very thorough test cycle involving thousands of users, Clarion 9.1 Gold is released today! From the implementation of support for the Win8 API for accepting Touch input, to the new support for Registration-Free COM, and the new i64 family of functions, this is a very important release. All told there were almost 350 public fixes/changes/features implemented. The release today includes additional changes/fixes and enhancements since the last beta release. View the complete list here. A final pre-release for 9.1 is on it’s way out this afternoon. Next week we’ll release updates to all add-on products, and some new examples. In the next release we changed how launching of the on-screen keyboard for text-like controls behaves. 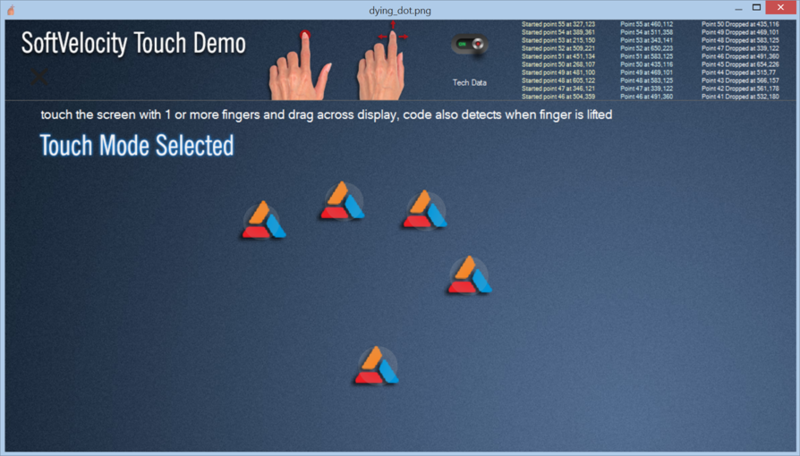 The Touch support is built in to the RTL, and no explicit code is needed for your program to respond to Touch input. The RTL implementation is based on the Windows 8 API. *Currently for Windows 8 and 8.1 Microsoft has removed the OS level functionality for Desktop apps to automatically show the On-Screen Keyboard when a text-like control (Entry, Textbox, Drop Combo, etc.) control gains focus. We have added support in the “Enhanced Focus” template code to workaround this limitation. 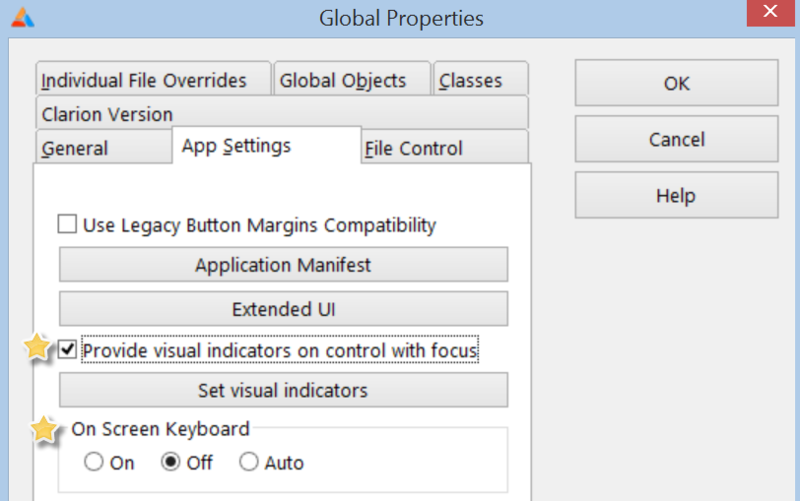 To enable your programs to automatically display the On-Screen Keyboard go to Global Properties->Actions-App Settings and check the box for “Provide visual indicators on control with focus”. Then choose the desired radio button for the On Screen Keyboard. On – Your program will attempt to launch the On-Screen Keyboard on any device. If the On-Screen Keyboard isn’t available no error is displayed to the end user. Off – Your program will not try to launch the On-Screen Keyboard. Auto – Your program will ask the OS if the device supports Touch input. If the OS indicates the device supports Touch input the On-Screen Keyboard is set to activate on text-like controls, otherwise it is set to Off. Enabling and disabling of the On-Screen Keyboard can also be set globally for the application at runtime by calling the SetOnScreenKeyboard() method of the EnhancedFocusManager class. Yesterday (March 13) we released an updated beta version. We are getting close to a general release and we’ll know better after the beta testers have had a few days to work with this release. This is the default value. TIME(0) is converted to 1 (TIME:MIDNIGHT), i.e. mid-night to mid-night. The compiler generates code to convert TIME(0) to 0 (TIME:NOTIME). This is the default value. The compiler does nothing additional for fields of SQL tables having the TIME data type. If the TIME value to convert is a field of a FILE, the compiler generates a call to the NULL function. If the result from the NULL() function is TRUE (field has a NULL value), the TIME field is converted to 0 (TIME:NOTIME) value. Otherwise, conversion is controlled by the define(time0) pragma. It is easiest to set the PRAGMA to the desired value at the Project level (Project Properties) But PRAGMA directives can be set before any line in your code where TIME value is being used in an expression converting TIME to LONG). Related; All SQL drivers have been updated so that a call to NULL(datefield) or NULL(timefield) will return TRUE if they are part of a DATE/TIME Group, and the corresponding column on the server is NULL. We released 9.1 beta 4 last Friday (Feb 14). The news on the 9.1 release has been focused on Touch support and Registration-free COM support, but there is a LOT more than that in this release. Check the readme here for the complete list of fixes/changes and new features. We’ve expanded the beta test group to ~100 developers – if you’re a Clarion developer who is interested in working with the beta version, and have the time and patience to work with beta software… we’d be glad to add you the group – send an email to support to request access.